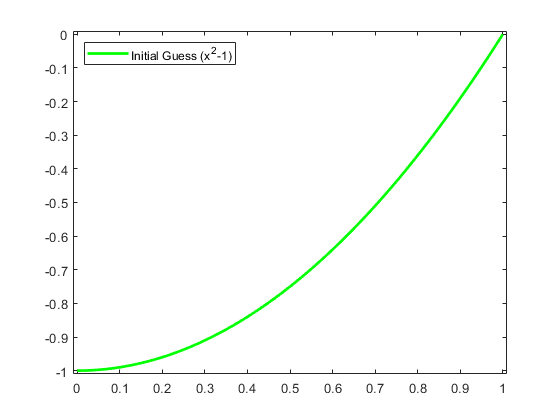 This example shows how to use spline commands from Curve Fitting Toolbox™ solve a nonlinear ordinary differential equation (ODE). Dg(0) = g(1) = 0. We seek an approximate solution by collocation from C^1 piecewise cubics with a specified break sequence breaks, hence want the order k to be 4. The number of degrees of freedom, 10, fits nicely with the fact that we expect to collocate at two sites per polynomial piece, for a total of 8 conditions, bringing us to 10 conditions altogether once we add the two side conditions. with w_0(x) := 2y(x) and b(x) := (y(x))^2 + 1. This system converts into one for the B-spline coefficients of its solution z. 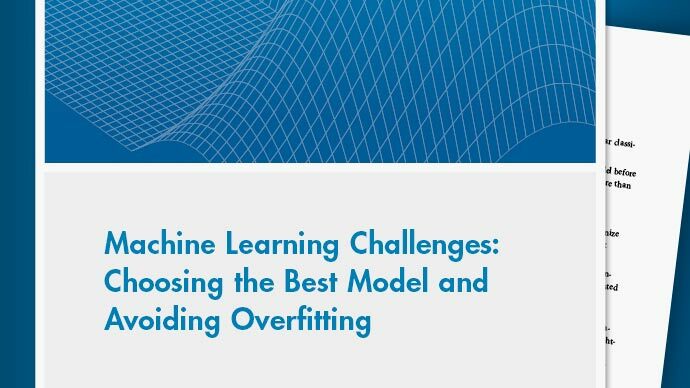 For this, we need the zeroth, first, and second derivative at every x in sites and for every relevant B-spline. These values are supplied by the spcol command. 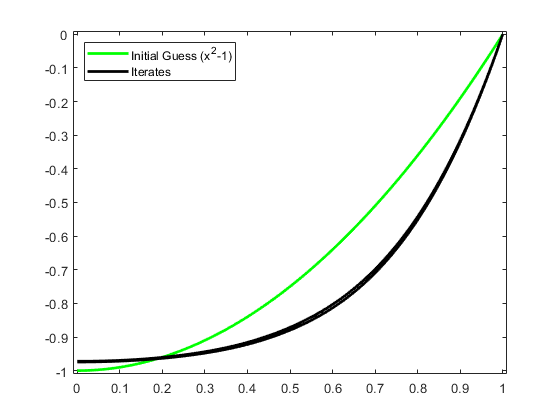 'cumulative' multiplicity of TAU(i) in TAU. with brk2knt used here to triple each entry of sites, and thus we get in colmat, for each x in sites, the value and the first and second derivatives at x of all the relevant B-splines. From this, we get the collocation matrix by combining the row triple associated with x using the weights w_0(x), w_1(x), w_2(x) to get the row corresponding to x of the matrix of our linear system. We plot the result, to be sure -- it should be exactly x^2-1. We can now complete the construction and solution of the linear system for the improved approximate solution z from our current guess y. In fact, with the initial guess y available, we now set up an iteration, to be terminated when the change z-y is less than a specified tolerance. 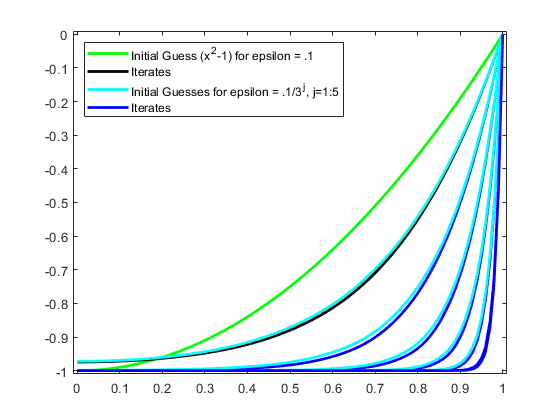 The max-norms of the change z-y at each iteration are shown as output below, and the figure shows each of the iterates. That looks like quadratic convergence, as expected from a Newton iteration. 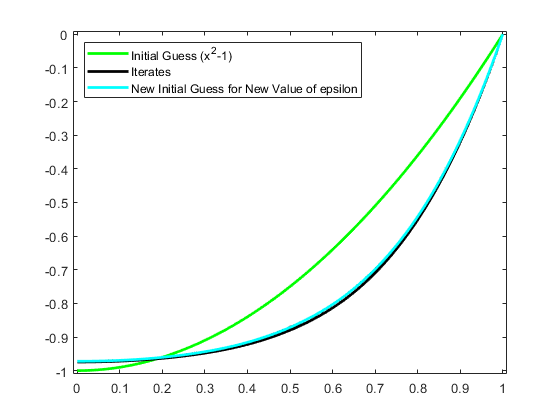 If we now decrease epsilon, we create more of a boundary layer near the right endpoint, and this calls for a nonuniform mesh. We use newknt to construct an appropriate (finer) mesh from the current approximation. and then the new collocation matrix. 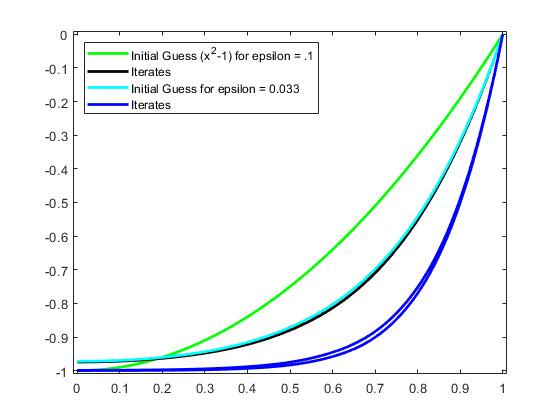 We obtain the initial guess y as the interpolant from the current spline space to the computed solution z. We plot the resulting interpolant to be sure -- it should be close to our current solution. Now we divide epsilon by 3 and repeat the above iteration. Convergence is again quadratic. 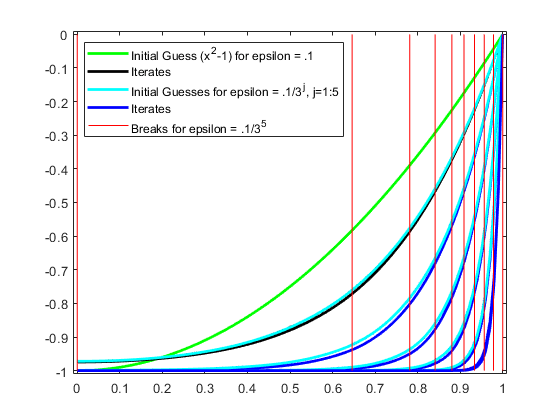 For a much smaller epsilon, we merely repeat these calculations, dividing epsilon by 3 each time. Here is the final distribution of breaks, showing newknt to have worked well in this case. 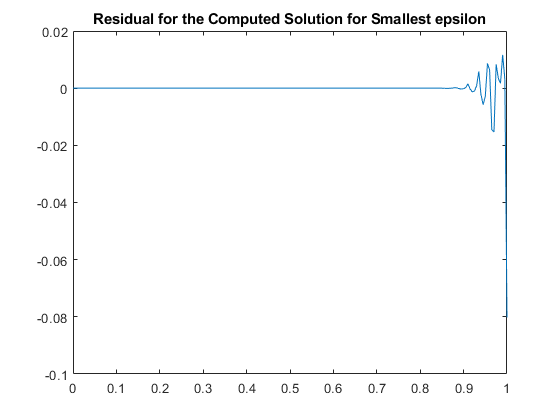 As a check, we compute and plot the residual for the computed solution for the smallest epsilon. This, too, looks satisfactory.